This broadly square garden is given dra­matic appeal by having several raised beds of different heights and sizes. These not only bring variety to the garden but leave an asymmetrical, curvy lawn, which draws attention away from the symmetry and squareness of the plot. The eye is encouraged to rove to all parts of this garden, where there is always some­thing interesting to see. Even the imposing back wall is cleverly broken up by the slightly lower wall in front of it to bring the eye back to the garden. What could be a dark, sunken space with little light is turned into a sheltered haven with colourful plants and year-round appeal. Using a wide range of shrubs as the dominant planting not only provides interest but also makes the garden low main­tenance. 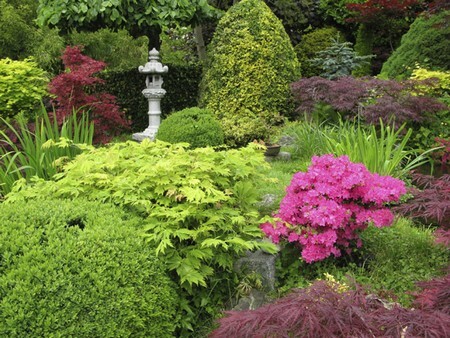 Once established, this garden will require very little work to keep it looking good, apart from the lawn, which will need routine care and mowing. The grey bricks used to construct the walls contrast well with the foliage and show off the flowers to great effect. Because this garden faces away from the sun, the higher bank has been left free of plants to admit the greatest possible amount of light. The small patio area is plain, and the plants come right up to the house, bringing the garden close to the living area and entic­ing people outdoors. The steps from the patio lead straight to the lawn, which pro­vides the perfect cover for the central area, with the smooth green forming a strong con­trast to the grey bricks and the surrounding plants. The white mowing edge and steps frame and emphasize the lawn’s unusual shape, and at the same time the white line serves to unite the patio area with the rest of the garden. Using higher raised beds at the back and lower ones at the front makes it possible to create a verdant, lush backdrop of plants and the illusion of a deep, dark boundary. The widely spaced slats in the fence provide privacy without blocking light. Using shrubs with attractive foliage and planting a combination of deciduous and evergreen shrubs and small trees ensure that there are ever-changing colours and foliage interest all year. An advantage of using raised beds is that it is possible to create the right conditions for particular favourites — soil that will suit a group of acid-loving plants can be provided in an otherwise neu­tral garden, for example. In this scheme camellias, rhododendrons, azaleas and heathers in the corner facing the house create a blaze of colour. The plants have been chosen for their interesting shapes, textures and colours. Low perennials are planted among the shrubs to add extra colour and interest in summer. A mix of different greens and varying leaf sizes helps to create a restful atmosphere, while the colourful corner opposite the house offers interest and, facing the sun, makes a sunny, attractive corner. Colour in the border does not depend solely on flowers. Plants with silver or blue-tinged foliage, such as Stachys byzantina (lamb’s ears), Artemisia ludoviciana (western mugwort) and Santolina chamaecyparissus (cotton lavender), will lighten borders and provide a variety of forms and textures, as their subtle hues and textures form a silver-blue bed. 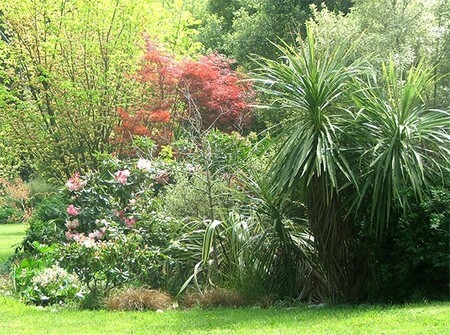 The hard edges of the garden are obscured by selecting plants that grow towards and over them. Height is provided by plants such as Buddleja globosa, while summer bedding plants increase variety at ground level, and additional spring interest could be provided if wished by underplanting some of the shrubs with bulbs. One small bed has been left for annuals, to give some scope for ‘pottering’ and a continual change of colours in this area.